After successful Andromax C as the best-selling smartphone released Smartfren , now re- launched a new series Andromax Smartfren G. apart addressed the same segment , namely the class teenagers and beginners , between Andromax Andromax C and G are also produced by the same vendor , namely Hisense . And officially , this latest smartphone is labeled Hisense AD687G Smartfren Andromax G.
In terms of design , nothing too flashy , for those who are already familiar with previous Andromax series , then G is like appearing Andromax mediocre . 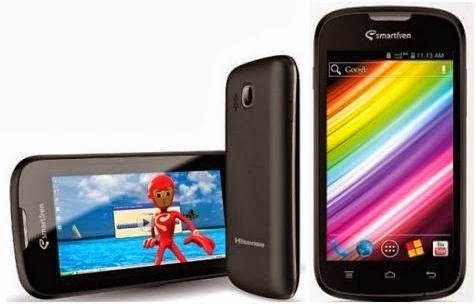 With runs on Android OS 4.1.2 , it stands to display interface follows the style of the series Andromax others , such as i2 and Andromax Andromax Z. More details Andromax body structure G , just above the screen are the earpiece hole , secondary camera lens and proximity sensor . In addition to already runs on Android 4.1.2 OS , dual -core processor 1.2GHz was already , plus a boosted 3.2 megapixels main camera . The main features are ogled imaging , the resolution presented is not superior , but adequate in -class price offered . Some menu that complements include flash light, night mode , digital zoom , white balance , effects , self timer , panorama , face detection , ISO , and photo editor . When it comes to the ability of the connection , must be directed to use a mobile broadband network with EVDO Rev A Smartfren that can deliver data speeds up to 3.1 Mbps . You were not going to be bothered running out of memory . Smartfren Andromax G sold at Rp . 949 000 , including the Smart Plan package is valued at USD 50,000 which contains 1.5 GB of free data volume , 60 SMS , 20 minutes phone to another carrier , and phone as much to fellow Smartfren .